Auntie Em's Studio: Pattern making is not for wimps! In the last year or so I've designed some of my own knitting patterns, which I quite enjoy. Mostly they have been clothes for the stuffed animals that I knit and usually I make it up as I go. I have a small problem, however, with recording these patterns for future use or for sharing with others. I have found that writing the pattern down takes a great deal more time than just making the project would. I try to write instructions down as I go, but it's rather annoying to stop knitting every couple of rows. I usually quit jotting down instructions after a while. And it is nearly impossible to tell what I did once the items are finished. My grandfather recently requested some slippers and I decided to make up my own pattern since I couldn't find any that I liked. I started out well. I made a gauge swatch and wrote down some instructions. I even made cable charts! 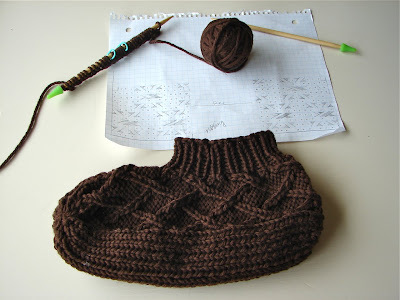 I have finished one slipper and I feel pretty confident that I will be able to repeat the process for the other. As usually happens, however, I got so caught up in figuring out how to actually make the slipper, that I didn't write down much of how I finished it. Perhaps with the second slipper, since I now know what I am doing, I can write down what I'm doing as I go. 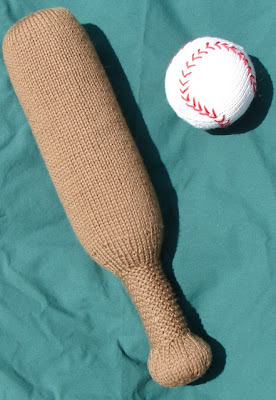 The one pattern that I feel like I have been able to successfully record is the knit baseball bat that I designed as a gift for my nephew's second birthday. I just need to polish the pattern up a bit and I think other people will be able to follow it quite easily. I recently used my pattern to make a second bat and ball which I have for sale on my etsy shop. I love making things that I design myself. There's no better way to make exactly what you had in mind. It's much better than searching through pattern books and the internet for hours only to settle for something that resembles the dream you had. Now I just need to tackle that pesky pattern writing!